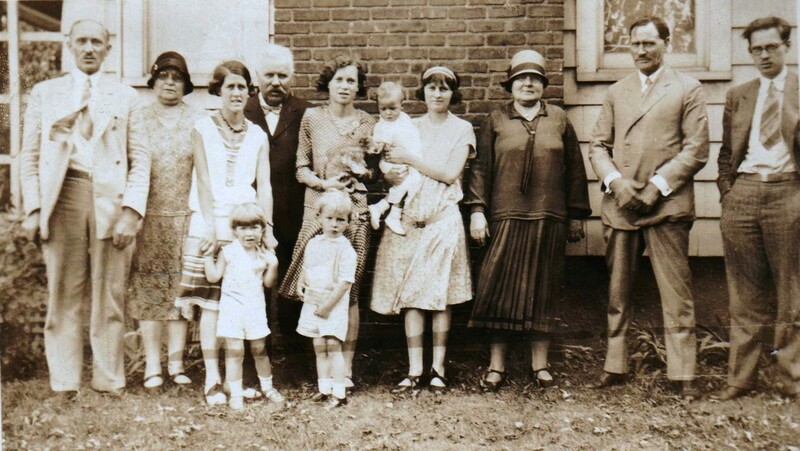 Although the occasion is lost to time, the Riises and Andersens were gathered together in Queens Village in 1929 when this fantastic photograph was taken. Pictured (left to right): Hans C. Riis, Helene Andersen Riis, Alva Lundquist Riis, Clifford A. Riis, Hans J. Andersen, Helene E. Riis (holding cat), Robert T. Riis, Warren A. Riis (infant), Ida Adams Riis, [Ane] Marie Andersen Gudmundsson, Ingvar Gudmundsson, Thor C. Riis. Not pictured: Alfred Riis, taking the photograph. Looks like it was summer time from outfits. July 4th? Any b-days in July ot August! I would recognize uncle Thor anywhere! !! We have this photo…thanks for sharing.